Property in Morocco is becoming increasingly popular with investors as it offers excellent value for money and capital growth prospects at an average of 15 per cent. This is expected to continue thanks to the seven billion euros being invested in the UAE Vision 2010, a concerted effort to increase tourism to 10 million visitors a year by 2010. With this will come huge demand for rental properties, which is great news for buy-to-let investors. What is even better is that investors can benefit from exemption from rental tax for five years, no inheritance tax and no capital gains if the property is sold after 10 years. Think Morocco and Marrakesh or Casablanca come to mind. But what many people don’t realise is that Morocco has one of the best coastlines of the Mediterranean, with stunning beaches, pretty towns and while the cities may now be pricey, the coastal areas are where you’ll find the bargains. Exotic Morocco in North Africa is an easy hop from Europe – and a cheap one, thanks to the budget airlines – and offers ancient cities, beautiful beaches and markets full of spices, carpets, leather goods and jewellery. Morocco’s delights are many. There are miles of unspoilt beaches and an excellent climate all year, property prices less than 50 per cent of popular European resorts, a low cost of living (think Spain in the 1970s), golf courses, the exotic Moorish culture – and the Costa del Sol is just 30 minutes away by hydrofoil. Purchasing property in Morocco is quite straightforward but, like anywhere else, you should always use an independent lawyer. 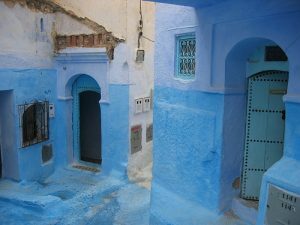 It’s very common for properties to lack title deeds in Morocco. If this is the case, and it turns out to be a problem, you’ll be refunded any deposit you’ve paid. If you do decide to buy in Morocco, you’ll be in good company. Other homeowners include Elizabeth Taylor, P Diddy, Richard Branson and the Beckhams. Winston Churchill’s second home – Mamounia – in Marrakesh is now a luxury hotel with a spa and gourmet restaurant, and fashion designer Yves Saint Laurent has a villa in Marrakesh.